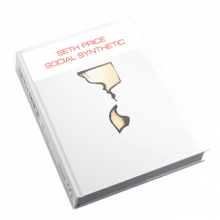 Social Synthetic presents a comprehensive overview of the artistic career of Seth Price (1973). His innovations, interests, and themes have been widely influential on both his own generation and younger artists, due partly to his approach to digital manipulation and cultural flux, in which a deep kinship with technology meets scepticism towards these advances. A key theme in Price’s work is the self under technological pressure, which is expressed through his sculptures, installations, films, photography, drawings, paintings, video’s web design, clothing, textiles, music, sound, and poetry. This publication is a coproduction with Buchhandlung Walther König.